The sharks eye seashell is easy to identify with it’s round, swirled shape. I have a few of them, but the big ones (they can be up to 3 inches across) are truly gorgeous. 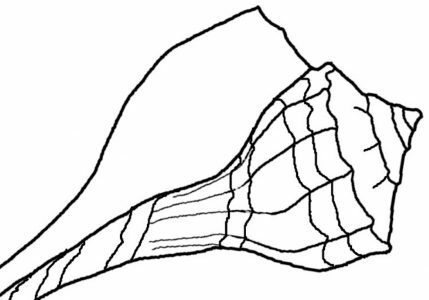 The shell is smooth and usually a gray-brown color. It’s a chunky round shell and I’m always on the lookout for one when I am near the ocean. While walking along a deserted beach on a little island I found a gorgeous shark’s eye! It was big and so lovely. Then, my excitement lessened as I went to pick it up and it moved. A hermit crab had taken up residence inside. Just like all the other awesome shells I had found that day, it was a home for the spider-like crabs. Photos were all I could take with me, as I put the shell back on the sand. Darn, it was a beauty! I lightened up the image above so you could see the hermit crab tucked up inside the shell. They usually don’t come out unless left totally alone. Some of them are up inside the shells so far that they can’t be seen at all (which is why I took one home by accident). And almost every shell I find out on the Indian River has a hermit crab inside it! I only had my cell phone camera and it’s difficult to see anything in the bright sun. I basically have to take the shots blind and hope for the best. This one didn’t come out so great, but I figured I’d share so you can get an idea of that “eye” in the center top. If it had been empty, I’d have collected it in a minute! I think it would have cleaned up nicely. While beach-combing in another area I managed to find a tiny shark’s eye shell in the sand. It was broken, but I snatched it up anyway. No crab inside this one! I also found more interesting seashells that day. If you are interested, go read that post. I agree. One of my favorite kinds.